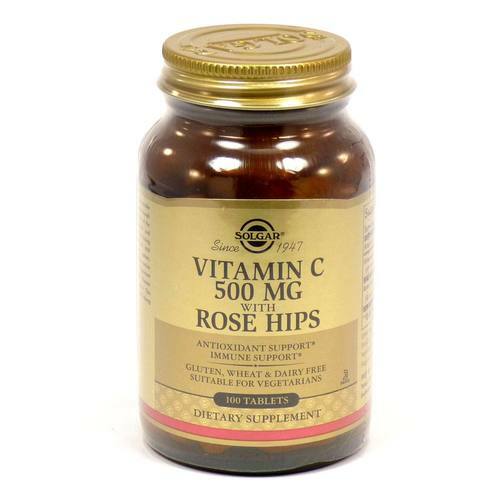 Solgar Vitamin C with Rose Hips is a water-based antioxidant. 警告: If you are pregnant, nursing, taking any medications or have any medical condition, please consult your healthcare practitioner before taking any dietary supplement. Discontinue use and consult your healthcare practitioner if any adverse reactions occur. Keep out of reach of children. 注意事项: Vegan. Free of gluten, wheat, dairy, soy, yeast, sugar, sodium, artificial flavor, sweetener, preservatives and color. Non-GMO. 推荐用法: As a dietary supplement for adults, take one tablet one to two times daily, preferably with meals or as directed by a healthcare practitioner.